Charlie House charity supports children with disabilities and provides a network of support. A Children's charity in Aberdeen is hoping its £8m appeal to create a respite care centre will transform the lives of hundreds of families across the north east. 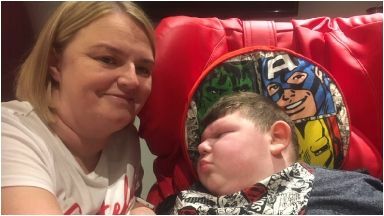 Families like Joanne Jamieson, who has a seven year old son with cerebral palsy, say plans for the support centre for children with complex needs will be life changing for them . Rory was born with a variety of severe health issues and his parents struggled to cope when they were faced with becoming full time carers. Joanne said: "We were completely lost . He had a feeding tube so people always looked at us and I didn't want to go out on my own. "We didn't know what to do and we didn't know what the future held for us and we certainly didn't know where to turn for help." By chance Joanne met the founder of the Charlie House charity which supports children with disabilities and provides a network of support for families like the Jamiesons. Since the charity was launched in 2011 it's had one big dream- to create a specialist support centre for children and their families in the North east . It's just launched it's Big Build Campaign to raise £8m that could make their dream a reality. Chairwoman of Charlie House Tracy Johnstone said her team were thrilled and excited to launch the Big Build Appeal Appeal. She said "Families which currently use similar facilities have to travel more than 100 miles from Aberdeen so it's not local and it's not easy to get to. "Having something local and knowing someone is at the end of the phone who understand your needs will make a huge difference to families." Currently families have to travel to Kinross or Glasgow to access planned and emergency short breaks. "When you have a child with such complex needs you spend 95 per cent of your time as a carer and five per cent being a carer and that's a horrible balance" explained Joanne. The charity say they have been overwhelmed with the support of people in the North east to help reach their target.